"Okay George, let's try this one. Pretty simple." I gave George the puzzle. He picked up his marker and quickly sketched out the following. "Well... I guess.... I guess that's the right answer then..." George muttered sadly. What was the puzzle I gave him? It looks like a version of the Prisoner's Dilemma. 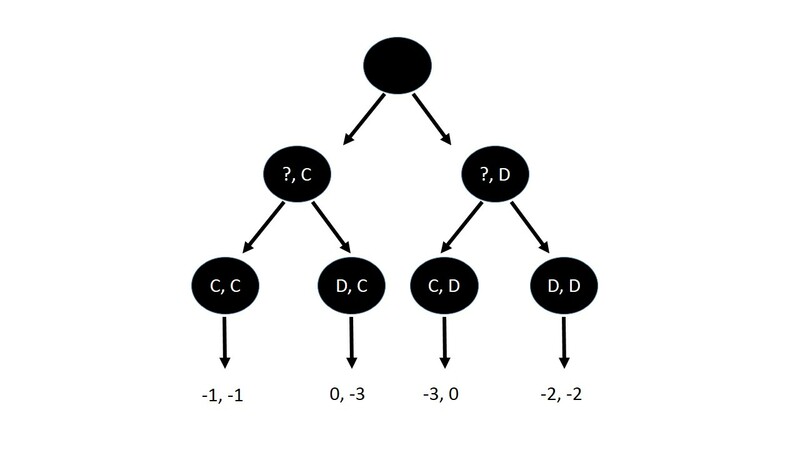 You're player 2, and the choice is either to Cooperate or to Defect, after which player 1 will make their choice on the second level of the tree. If you both cooperate, you get the best overall outcome ("only" 2 points lost total). But a defector to a cooperator gets a better outcome for themself (no points lost at all, compared to 1 if they both cooperate), to the detriment of the poor cooperator, who loses 3 points. An evil games-master has locked you in a room and strapped you into an armchair, so that you can't move your head, arms, legs, or body. Directly in front of you, separated by a chainlink screen, is somebody else in the exact same predicament. You can both see each other, but your hands are encased from the wrists onward in a hard metal shell. Neither of you can see either of your hands, although obviously you can feel your own. A loudspeaker blares. "Welcome, the two of you, to the Double Chairs of Demise. I take it you two are comfy where you are?" You struggle in your seat and try to shout, but you find that your vocal cords have been disabled by something implanted in your throat. You slump back down. "You two have been chosen for a special experiment," says the games-master. "I dabble in human psychology, and you two are the perfect rats for this little contraption I've devised." "You will participate in a game that lasts for ten turns," he continued. "In your hand pods, you will feel two buttons on each hand. From left to right, these buttons are labelled A, B, C, and D". You feel around for the buttons, only to discover that the buttons for your left hand have been removed! You can definitely feel two distinct buttons with your right hand, but in the pod your left hand is encased in, there is nothing but a bare metal surface. It looks like only options C and D are available to you. You look at your opponent, who seems to have a look of shock and panic on his face that indicates the same thing. A display flashes up on the wall in front of you with the number "10". "You start the game with 10 life points. At the end of every turn, I will take one life point away from each of you. If you lose all 10 points, you die." His voice turned into an evil cackle at the last word. "But, all is not lost. For you see, during your turn you will have a range of actions available at your disposal to try and gain points before I take one away." "If you press the button A", the games-master says, "you will each gain one life point, but the game will go on for one more turn. If you press the button B, you will sacrifice one of your own life points to give your opponent two. If you press C, you pass your turn and nothing will happen. If you press D, you will take one life point back for yourself, at the expense of your opponent losing two!" "And best of all," cackled the games-master, "your action is completely independent. It has no bearing on the effect of your opponent's action. None at all! So anything you do is an action by itself!" You can hear a switch being flipped. "Let the game... begin." George, seeing this scenario, deduced that both players would continue to press D, trying to claw back that one point they couldn't get for themselves, and thus they would kill each other in just five turns. It's sad because regardless of whether they cooperated or both defected, both of them would die anyway, unless one of them deliberately lost to keep the other alive. Not the answer you're looking for? Browse other questions tagged enigmatic-puzzle game-theory reverse-puzzling or ask your own question.